There’s no better meal than grilled meats, grilled vegetables, grilled fruits--really grilled everything. The more, the merrier, but one of the best-grilled foods of all time is beef -- without a doubt. Those sizzling juices just make your mouth water! How do you ensure the best-grilled beef? Use these five tips. #1 Get your grill hot. When it comes to grilling, the hotter the grill, the better. Of course, you need the right grill, like our PGS Grill Residential A-Series. The high heat is what develops the flavor. Your beef will have that great grilled exterior while maintaining a juicy interior. #2 Don’t lose your marbles. The best steaks are marbled, like the perfect rib-eye or T-bone. The right amount of marbling keeps the meat juicy and delicious. #3 Use the KISS principle. KISS stands for keep it simple, silly. Steaks only need salt and pepper for seasoning, nothing else. When you bring the steak off the grill, give it a light sprinkling with sea salt right before serving. It’s perfect. If you are oil-coating your steaks, dip them rather than brush them so the seasoning stays on the meat. Use a blended oil, like a canola/olive oil blend in a 90/10 or 80/20 ratio. Whatever cut of meat you remove from the heat of the grill, always let it rest, at least 10 minutes to seal in the delectable beef juices. Now you’ve got the right grilling tips, but how do you choose the best beef to grill? When it comes to beef, it is the most popular and you have many grilling options. For the best burger, use a 50/50 mix of ground chuck and ground sirloin. Again, all you need is salt and pepper right before cooking those juicy burgers. Perhaps you’re looking for something a little meatier. 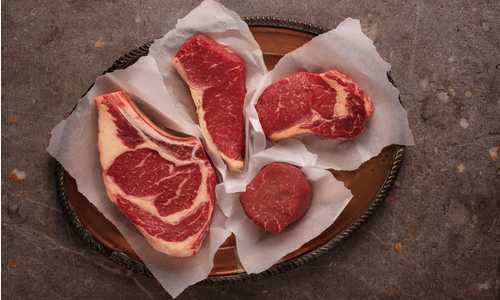 Choose a steak with great marbling, like a porterhouse, T-bone, ribeye or New York strip for the best grilling. If you want a larger cut of meat on the grill, you can do large roasts, but remember to grill indirectly. If you grill too directly, the meat will overcook, dry out and become tough. Our PGS series grill comes with a built-in grill timer that provides a one-hour gas flow timer, so your grill will cut off even if you get so engrossed in grilling that you forget. Have you ever tried flank steak on the grill? If you haven't, you definitely should. Here is one of our favorite fast and easy recipes for Carne Asada. Buy 2 pounds of flank steak. You'll need 2 limes (juiced), 4 crushed cloves of garlic, a half cup of orange juice, 1 cup of chopped fresh cilantro, 1/2 teaspoon of salt, 1/4 teaspoon of black pepper, 1/4 cup of olive oil, 1 minced jalapeno and 2 tablespoons of white vinegar. Throw all of that in a bag, marinate overnight and grill 7 to 10 minutes per side. Yum! No matter what cut of meat you choose, gas grilling offers several advantages over charcoal grilling. If you’ve ever heard the phrase, “taste the meat, and not the heat”, it’s really true. When you use charcoal, the taste of the liquid fuel used to light the coals inevitably finds its way into the meat. Today’s gas grills are so advanced, using lava rocks or ceramic plates to create the radiant heat that your meat needs to cook properly. Heat is heat, and gas heat comes without that funny aftertaste. Any master griller knows that when the meat drippings hit the grill’s heat source, magic happens. The drippings hit the radiant plate and create a mixture of oils, proteins, and sugars that beautifully coat the meat you’re grilling. It is much easier to grill more delicate-tasting meats like chicken and fish on a gas grill. Many charcoal purists will say that a griller can’t get the smoky flavor on a gas grill, but that is simply not true. Buy an accessory smoke box to get just the perfect amount of smoke. Modern gas grills are so much better-engineered these days. They use less glass, operate at lower BTUs and are much more efficient. They also get as hot as you need them to, so grilling can reign supreme. Gas grills are much easier to set up and to clean up as well. So go ahead. Fire up that grill. Read our master grill tips, get your propane ready and pick that perfect cut of meat. You can’t go wrong! Bon appetite!